We all know how to make a peanut butter sandwich or even a hamburger. 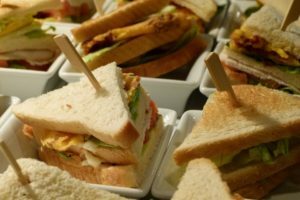 But if you want to make something that will be a big hit and fill hungry tummies you can add Club Sandwiches to your menu. It’s been around for a very long time and is believed to have originated in club cars of passenger trains. But regardless of where it came from, there are certain ingredients to keep on hand. This includes toasted white bread, some chicken, crispy bacon, and few vegetables. If you don’t have chicken, you can try adding turkey or shrimp instead. To start this recipe, you need the following ingredients so check your refrigerator and bring out at least 6 stalks of celery, 2 onions, 8 slices of bacon, 12 slices of toasted white bread, 2 pounds of chicken, 2 medium tomatoes and 4 lettuce leaves. When you have everything ready, you start by cooking the chicken and then let it cool after 25 minutes. As you know, the chicken that is used for the clubhouse sandwich is turned into chicken salad which is why you have to mix it with other ingredients. Once the salad is ready, it is time to cook the bacon until it is crisp and brown which should be done within 4 to 6 minutes. You better transfer the bacon to a paper towel first to drain the excess oil which is not good for those who have high cholesterol. The last thing to do now is to put everything together. You get a piece of bread and then spread the chicken salad on the surface. Put some bacon, tomato or lettuce in between before putting the next layer of bread over it and then doing it one more time until you have three layers of bread. With that, you now have a clubhouse sandwich. With the number of ingredients you used, you can share this with 3 other guests. Remember, a clubhouse sandwich has to be cut into quarters and then secured with a toothpick. That way, the sandwich won’t fall apart before it reaches your mouth. You can also put some side orders in beside the clubhouse sandwich by adding chips or fries. It is more than just a snack which is why a lot of people eat it for lunch. Its light and healthy at the same time because it gives you a combination of B vitamins, iron and protein. So the next time you feel hungry try having this instead of a large meal. It’s particularly good on a warm Arizona afternoon.